John Peña’s coworker looked at him as if he had lost his senses. “You’re going to lose that money,” she said. One evening, a technical glitch disrupted operations at the gas station where John Peña was working in the U.S. state of West Virginia. Business was booming at the gas station’s 23 pumps in the town of Mount Hope, but now credit cards could no longer be accepted, only cash. Making matters worse, the automated-teller machine stopped dispensing cash. John and a female co-worker watched as a big Cadillac pulled up at a pump and its owner, a well-dressed black man, filled the tank. “Are you going to tell that gentleman that he has to pay cash?” the woman asked John. Moments later, the man entered the gas-station store. John spoke with his manager, who suggested that the customer leave his car at the gas station while he went to get some cash. The customer said, however, that he didn’t have any way to get cash that evening. The man gratefully shook John’s hand. “I’ll be back tomorrow,” he said. After the man left, the coworker looked at John as if he had lost his senses. “You’re going to lose that money,” she scolded him. The next day, the man walked in with the $40. “Is there anything I can do?” he asked as he handed over the money. That evening, John shared the unusual experience with his wife, Sharon. But he promptly forgot about it when his father-in-law, Jim, stopped by to discuss the Bible. Jim was a Seventh-day Adventist and had been inviting John to visit his church for some time. Learning that evening that John wasn’t scheduled to work the next Saturday, Jim renewed the invitation to his son-in-law. John relented. “OK, I’ll go this time,” he said. John was born in a Sunday-keeping home in Cleveland and had attended an Adventist church a few times with his wife, who was raised Adventist but had left the church. John had never visited his father-in-law’s church in Beckley, West Virginia. After the church service, John and pastor Samuel Simuzoshya, a native of Zambia, explained to Jim what had happened at the gas station the previous week. The encounter with the Adventist pastor left a deep impression on John. 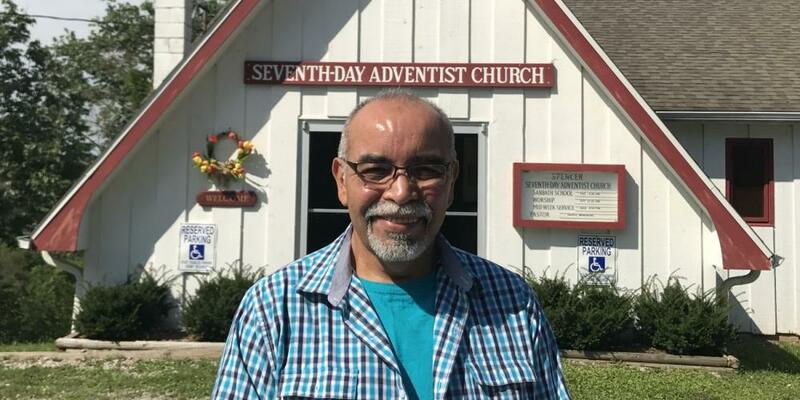 He started to attend Sabbath church services more regularly at Beckley and, later, at the church in Spencer, population 2,150, which is closer to his home. His wife was baptized. Then the Spencer church received part of a Thirteenth Sabbath Offering in 2015. Among the Thirteenth Sabbath projects that year was the staging of 35 evangelistic meetings simultaneously across the Adventist Church’s Mountain View Conference, which covers most of West Virginia and western Maryland. The Spencer church, which has about 35 regular worshippers, used its portion of the money to rent a large public hall for two weeks of evangelistic meetings led by one of its elders, William Iannacone. John joined church members in distributing literature and doing home visitations during the evangelistic campaign, but he did not go up to request baptism at the end of the meetings. Two days before the baptism of a girl from the meetings, the church’s pastor, Daniel Morikone, visited John at home to ask what was keeping him from giving his heart to Jesus. Reflecting on his path toward baptism, John said he was won over by seeing Christ’s goodness in church members. John, who is now 57 and a newly elected deacon at the Spencer church, hopes to bless his community in a similar way. 11-Year-Old Girl Touches Chaplain’s Heart Before Tragic Death “She showed me that it’s not about me. It’s about what we can do for others,” says Daniel Guiboshe. ​Catering for Christ Without Shrimp and Rum in Jamaica Married owners of a catering business share a remarkable story of courage after baptism.